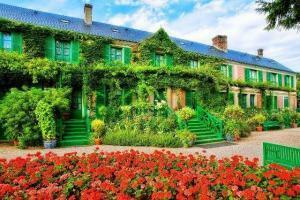 Giverny is classified by the French as part of the most beautiful villages in France. When you will arrive there you will be caught by its charm. The fact that Monet lived and worked there adds to its magic. In fact, it is because of its beauty and picturesque location that he settled there, bringing it out of the shadow forever into the light. MyDriverParis will take you on a journey to this wonderful area located one hour north west of Paris in The Vexin Regional Natural Park, a hilly unspoiled protected region with cliffs overlooking the great landscapes/scenery of the Seine River between Paris and the Atlantic ocean, a stroll through history and natural beauty immortalized by painters like Claude Monet and Vincent Van Gogh. Upon your arrival in Giverny, you will visit the local church painted several times by Monet that leads to the village graveyard where you will have a close look at Monet’s tomb. You can also visit the WATER GARDEN that Monet created on a piece of land neighboring his property and crossed by a small brook. It is inspired by the Japanese gardens that Monet knew from the prints that he collected avidly. After that, you will arrive to the FLOWER GARDEN named Le Clos Normand full of perspectives, symmetries and colors. It is divided into flowerbeds where flower clumps of different heights create volume. Monet did not like organized nor constrained gardens. He married flowers according to the harmony of their colors and let them grow freely. At the end of the Flower Gardens you will arrive for a visit to monet’s house. Your private chauffeur will drive you to the Domaine of Villarceaux, a peaceful site founded in the 11th/12th century. At first a benedictine convent, the place was transformed into an elegant residence in the 16th century with wonderful gardens and pools redesigned according to the Italian Renaissance style. After this wonderful tour in Giverny ,it will be time to head back to Paris.